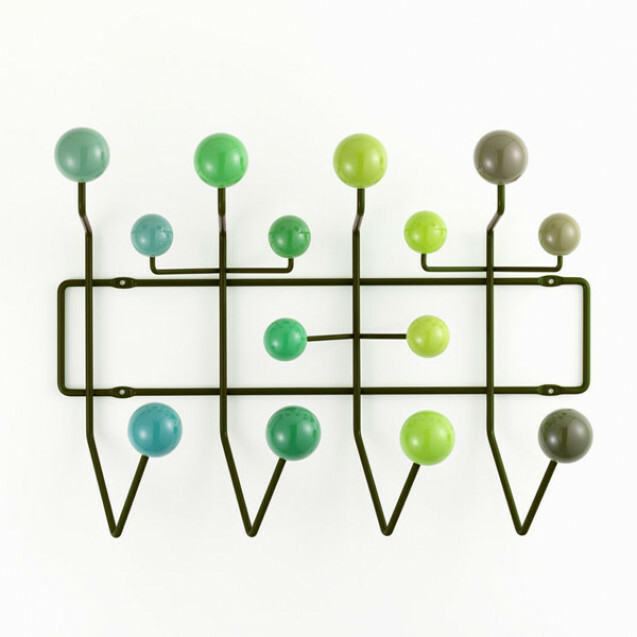 Used instead of simple hooks, the brightly coloured wooden balls of the 'Hang it all' coat rack are aimed at encouraging children to literally hang up all their things. 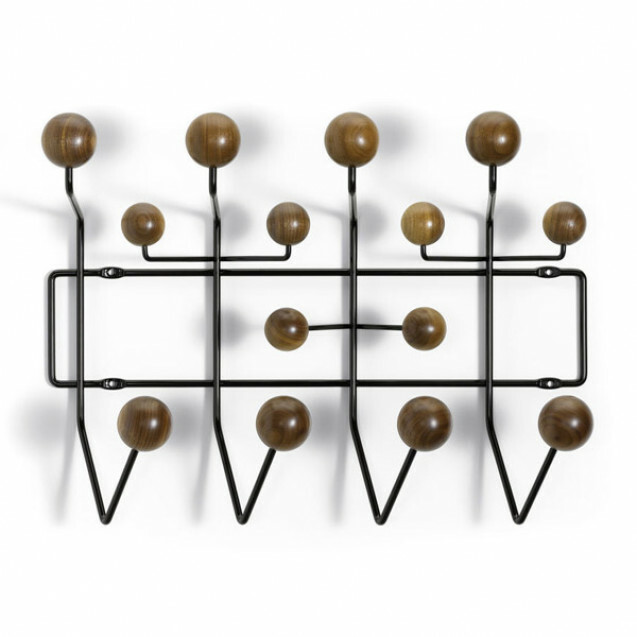 Thanks to the uniform distance between the balls, multiple coat racks can be mounted alongside one another for additional storage. 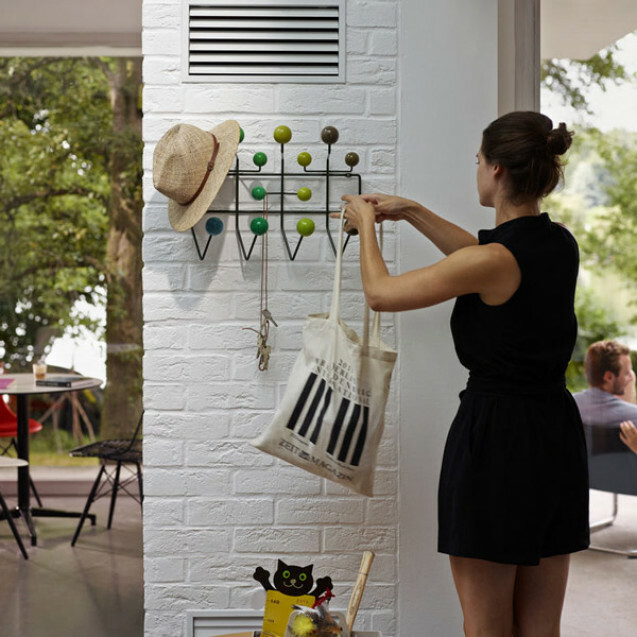 'Hang it all' is a cheerful alternative to boring coat hooks – and not just for children's rooms. 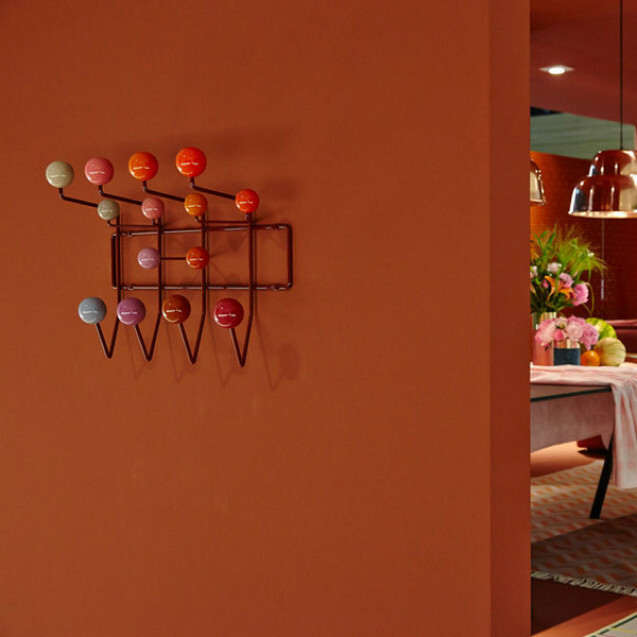 The original colour composition of 'Hang it all' was conceived by Ray Eames. 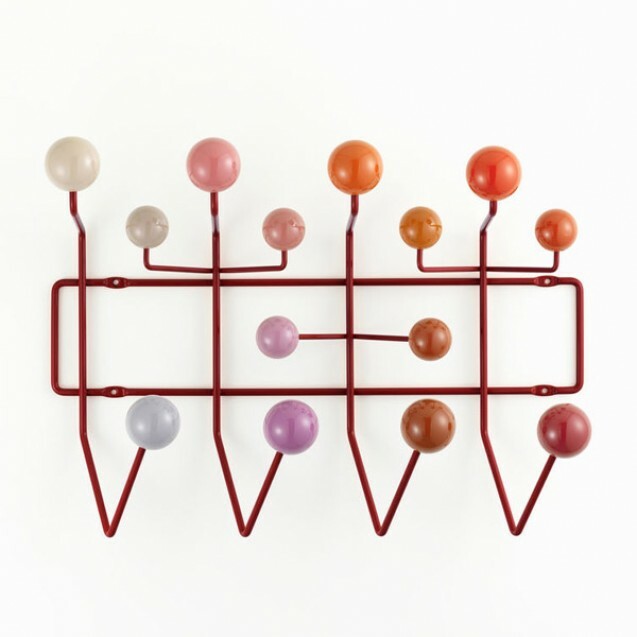 In celebration of what would have been her 100th birthday in December 2012, Vitra and the Eames Office developed three new versions of the coat rack in fresh hues of red, green and white. Charles Eames, born 1907 in St. Louis, Missouri, studied architecture at Washington University in St. Louis and opened his own office together with Charles M. Gray in 1930. In 1935 he founded another architectural firm with Robert T. Walsh. After receiving a fellowship in 1938 from the Cranbrook Academy of Art, he moved to Michigan and joined the faculty the following year. 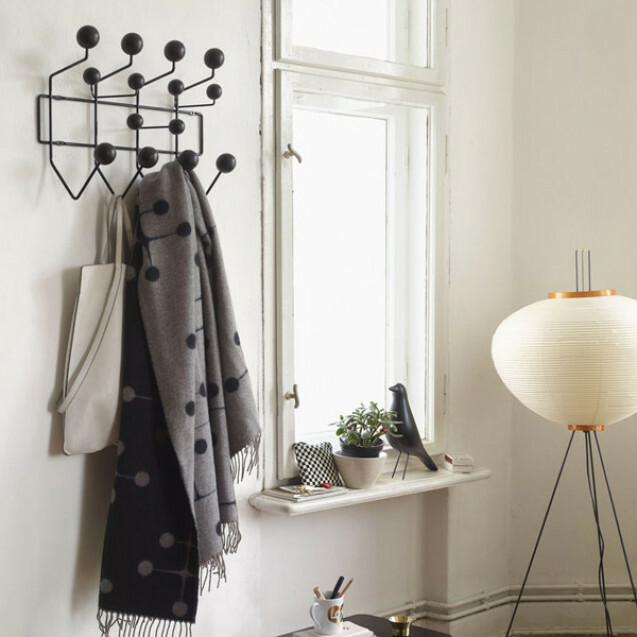 In 1940, he and Eero Saarinen won first prize for their joint entry in the competition 'Organic Design in Home Furnishings' organised by the New York Museum of Modern Art. 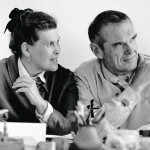 During the same year, Eames became head of the department of industrial design at Cranbrook, and in 1941 he married Ray Kaiser. Ray Eames was born as Bernice Alexandra Kaiser in Sacramento, California, in 1912. She attended Bennett College in Millbrook, New York, and continued her studies in painting under Hans Hofmann through 1937. During this year she exhibited her work in the first exhibition of the American Abstract Artists group at the Riverside Museum in New York. She matriculated at the Cranbrook Academy of Art in 1940 and married Charles Eames the following year. From 1941 to 1943, Charles and Ray Eames designed and developed stretchers and leg splints made of moulded plywood, and in 1946 they exhibited their experimental moulded plywood furniture at the New York Museum of Modern Art. The Herman Miller Company in Zeeland, Michigan, subsequently began to produce the Eameses' furniture designs. Charles and Ray participated in the 1948 'Low-Cost Furniture' competition at MoMA, and they built the Eames House in 1949 as their own private residence. Around 1955 they began to focus more on their extensive work as photographers and filmmakers, and in 1964 Charles received an honorary doctoral degree from the Pratt Institute in New York. The Eames Office designed the IBM Pavilion for the 1964-65 World's Fair in New York, and the year 1969 offered the opportunity to participate in the exhibition 'Qu'est-ce que le design?' at the Musée des Arts Décoratifs in Paris. In 1970-71, Charles was appointed as the Charles Eliot Norton Professor of Poetry at Harvard University. 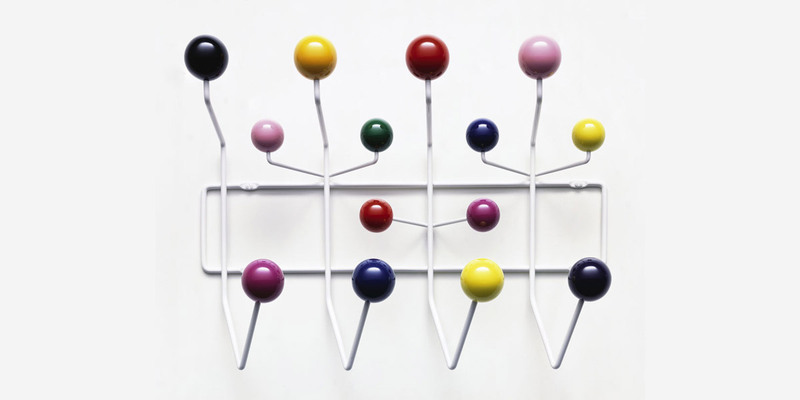 MoMA again presented an exhibition of the Eameses' work, entitled 'Furniture by Charles Eames', in 1973. Charles Eames died in St. Louis in 1978; Ray's death followed in 1988. Charles and Ray Eames have had a profound and lasting influence on Vitra. The company's activity as a furniture manufacturer began in 1957 with the production of their designs. 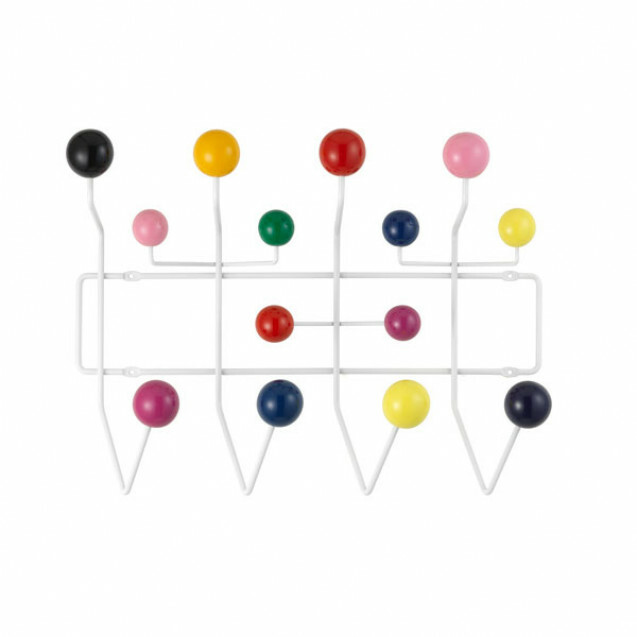 Yet it is not just the products of Charles and Ray Eames that have left their mark on Vitra. Even today, their design philosophy continues to profoundly shape the company's values, orientation and goals.